One of the great things about going on a boat holiday is that you can be as active or as laid-back as you’d like. For those who prefer to get a little exercise in between relaxation and travel, our guest blogger and fellow sailor, Heather Francis of Yacht Kate has some great tips for you. Read on to get these fun and simple holiday and vacation workout ideas which you can easily integrate into your next sailing trip with Zizoo. We hope these tips will help you stick to your New Year’s Resolution to keep fit and stay active this year. Sticking to a healthy meal plan and fitness regime can be hard when you live on land, but on board it often feels impossible to maintain a routine of any kind. Being constantly on the move means diet is often dictated by how thoughtfully you provision ahead and how much effort you put into preparing meals on board. Trying to exercise on a boat that is in motion can be very difficult, not to mention the space restrictions that many of us face. Finding alternatives ashore when your typical on-board activity levels dip isn’t always possible but there are ways to keep active and have fun while you cruise. Kayaking. Photo credit @Barbara Cole, CV Complicity. Kayaks have long been a popular addition to cruising boats and are a fantastic way to get out and explore an anchorage. 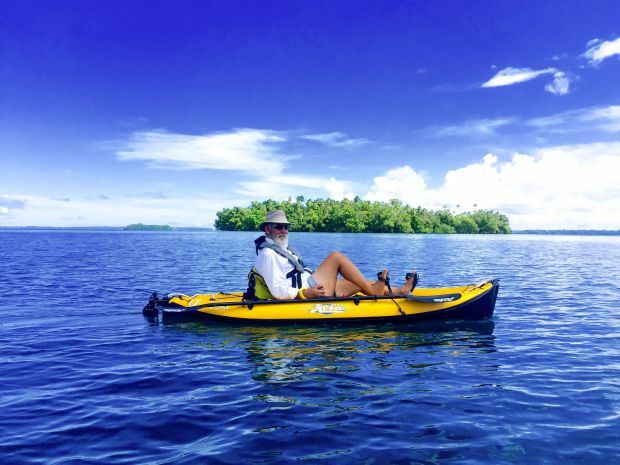 Stress reducing, low impact and a perfect activity for the whole family, kayaking offers a host of physical benefits. 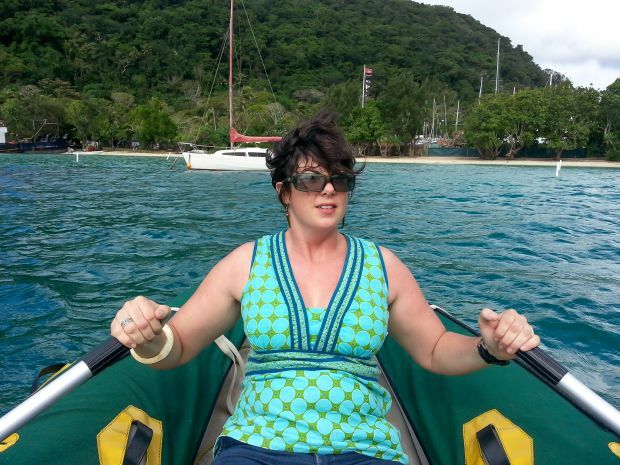 Traditional paddle kayaking strengthens the chest, back, shoulders and arms. You also work the core muscles of the torso as you rotate your body through a paddle stroke. Leg muscles are used to balance the kayak and to push during a power stroke. 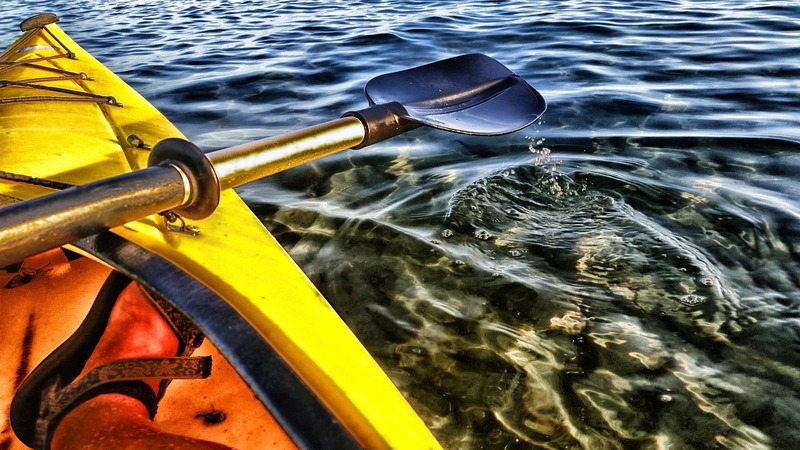 Depending on your location and the conditions kayaking can also provide cardio workout, for instance if you have to paddle against a current or race against a fellow kayaker. Why not request an inflatable SUP for your next boat holiday? Photo credit @Heather Francis. Stand-up paddling boarding is thought to have originated in Hawaii. Invented by surfers who were looking for a way get some exercise, and have bit of fun when the waves were small they basically changed their stance on the board and added a paddle. The sport has recently gained enormous popularity and it seems everywhere you go these days someone is SUP-ing. When you’re new to the sport it can demand a lot of mental attention as you concentrate on balancing and paddling at the same time. You use your legs and core as you constantly work stabilize yourself and the board. The arms, back and shoulders are exercised while you paddle. But don’t let the calm fool you, one trip around the anchorage and you’ll feel the burn. 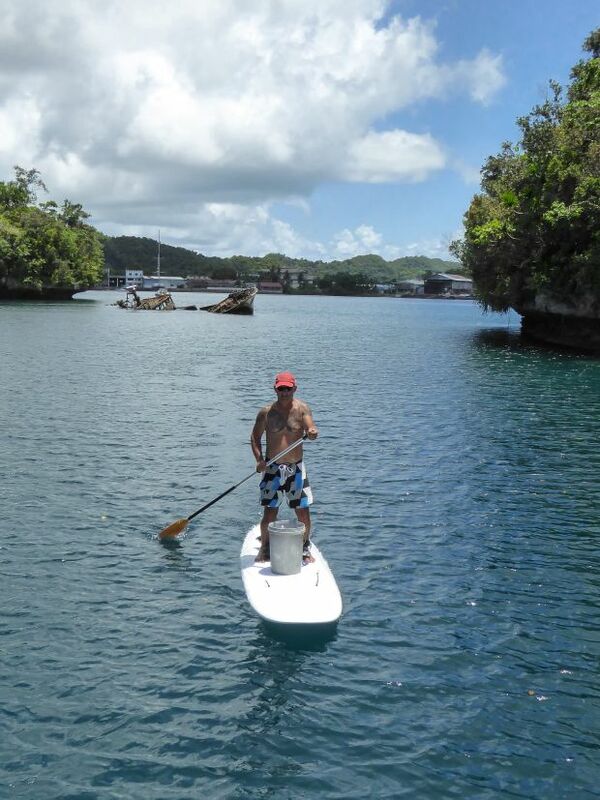 Stand-up paddle boarding is also a cardio workout and a great way to increase your endurance. Who needs a motorized dinghy when you can sneak in a little workout on your next holiday? Photo credit @Heather Francis. Chances are if you are on a sailboat then you have a dinghy, and no matter the design you can use your dinghy as a rowing machine. Whether it is up a quiet stream for a picnic lunch or just back and forth to shore, rowing is an easy way to keep your daily routine active. Some of the flat-bottomed inflatables don’t track that well, but instead of seeing this as a disadvantage think of it as a challenge; you’ll get a little more exercise as you try and reach your destination. No doubt you’ll be surprised how much of a workout you can get by pulling on the oars instead of the start cord. Yoga is a great way to start your day on any kind of holiday. Photo credit @Heather Francis. 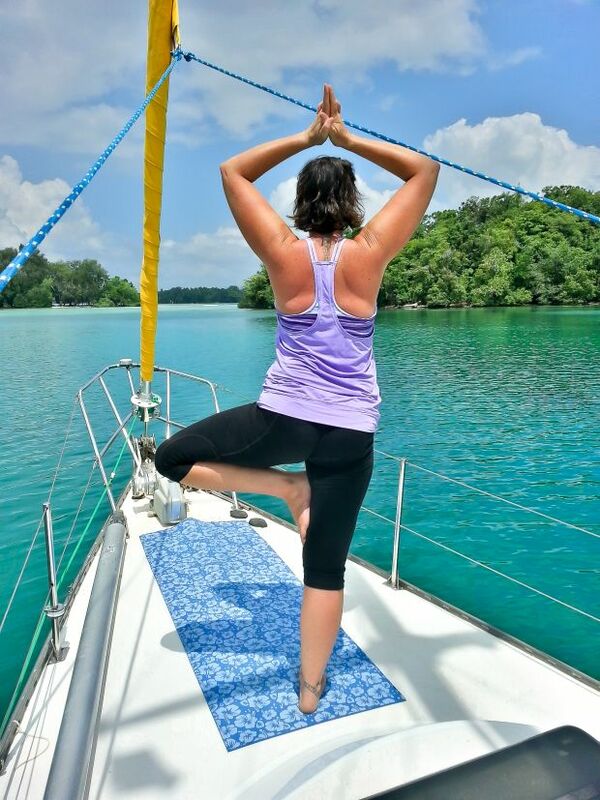 At first glance, yoga and yachts might not seem like a perfect pairing, after all, many yoga poses demand stillness and balance, two conditions not always attributed to life on boats. In fact, yoga and sailing have many things in common. Every day out on the water is different- you must adapt and adjust to varying winds and seas. Similarly, each day on your yoga mat different- you must change and alter poses depending on your mind and body state that day. All you need to start practicing yoga is non-skid mat and clothing that is both comfortable and that you can move effortlessly in. There is a wealth of information, magazines and videos online concerning yoga, but I think the best way to get a proper introduction is by attending a class with a qualified instructor. Recently, yoga instructor schools have popped up all over the globe with more and more people devoting the 200-500 hours needed to achieve their instructor rating, so chances are someone in your anchorage is qualified to teach. Check local radio nets to find out if there is a trained instructor in the fleet, most are keen to lead a group class or give private instruction. If you are already practicing yoga this is also a good way to connect with other people in your sailing area. We all like the laid-back, easy-going lifestyle of cruising but sailing demands a certain level of fitness. It is important to keep active even when circumstances seem stacked against you, but it need not be difficult and should definitely be fun. It is easy to turn the next anchorage into your new favourite gym, with a view. Keep fit and still have fun on your next sailing holiday with Heather’s boat holiday and vacation workout ideas. You can easily request for a SUP, kayak or other watersports equipment to add to your yacht charter holiday and we’ll take care of the rest.